Three Mo’ Tenors has been playing to deliriously happy audiences across the country. They’ve learned to work together and give the public a sensationally good time. The program showcases three vibrant personalities and an issue-the difficulties that African-American men face in the entertainment business, and particularly the classical music world. No African- American male singer has broken through the glass ceiling the way African-American women did 40 years ago, or the way Nat King Cole and Harry Belafonte did in popular music. But Three Mo’ Tenors isn’t a sermon, it’s a terrific entertainment that is all about music, singing, and talent; it celebrates the versatility that the African-American tenor has had to cultivate, the virtue he has made ofnecessity. 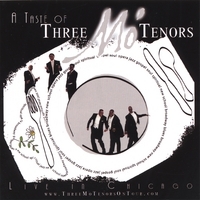 The music ranges through opera, show tunes, jazz, blues, soul, gospel, and spirituals; the three tenors sing music associated with everyone from Luciano Pavoratti to Gladys Knight. There’s a lively band under the direction of Joseph Joubert, an uninhibited singing-dancing ensemble of four, and a spirited gospel choir recruited locally, the snappy direction and choreography is the work of producer Marion J. Caffrey. One might criticize a few arrangements and the erratic, intrusive amplification, but no one left the Shubert disappointed. It was an evening that made you want to burst into song yourself.